In December 2017, Microsoft unveiled the Always Connected PCs lineup, which included two ARM-based 2-in-1 laptops from HP and Asus. Both laptops featured Snapdragon 835 system-on-chip and Snapdragon X16 gigabit LTE modem. The previous generation Always Connected PCs were powered by Qualcomm’s Snapdragon 835 processor, and as expected the next-generation lineup will run on the latest Snapdragon 850 platform. Today at Computex, Qualcomm announced the Snapdragon 850 Mobile Compute Platform for Always Connected PCs. 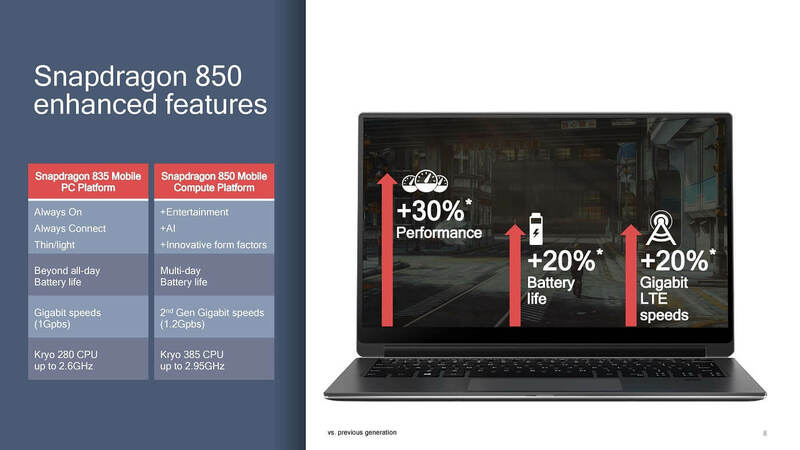 Qualcomm says that Snapdragon 850 Mobile Compute Platform offers a 30% boost in performance, and it’ll power the next-generation Always Connected PCs. The chipset is designed to offer 20% better battery life than the predecessor and it also improves the LTE speed by 20%. Qualcomm Snapdragon 850 is for Windows 10-powered PCs only, and it won’t power the Android smartphones. Interestingly, the processor is based on Snapdragon 845 but it’s more powerful. The new processor can be clocked at up to 2.96GHz, and also supports Adreno 630 GPU. The devices powered by this processor will offer HEVC video encoding of 1080p video up to 120fps and 4K UHD video playback. Snapdragon 850 offers up to 1.2Gbps LTE download speeds, thanks to the Snapdragon X20 4G LTE modem. It comes with 802.11ad Multi-gigabit, a WiFi technology, and it supports 2.4GHz, 5GHz, and 60GHz bands. Qualcomm has also included the Spectra 280 Image Signal Processor but it only supports 4K video recording at 30fps. “Building on the portfolio of Always On, Always Connected PCs established over the past year, we are thrilled to work with Samsung to help offer consumers true mobility combined with the productivity and entertainment features of Windows 10,” said Alex Katouzian, senior vice president and general manager, mobile business unit, Qualcomm. Qualcomm’s new Snapdragon 850 Mobile Compute Platform for Windows 10 Always Connected PCs offers better life and performance at the same time. The PCs are finally on par with the rivals, and in fact, it’s better given that it can offer day-long battery life, and last up to one month in standby mode.